Throughout the digestive tube, the walls of the organs are made up of four layers: mucosa, submucosa, muscularis, and the serosa or adventitia (Figure 4.2). The innermost layer of the digestive tube is the mucosa. This layer is composed of three parts: the epithelium, the lamina propria, and the muscularis mucosae. The innermost part of the mucosa is the epithelium. Most of the epithelial layer is made up of a single layer of cells called columnar epithelial cells. These cells are lined up like columns with one end exposed to the material in the digestive tube and the other end forming the connection between the epithelial layer and the tissue beneath the lining. Everything absorbed into the body must pass through these cells. In addition to the columnar cells, mucus-secreting cells called goblet cells because of their unique shape (narrow bottom and wider top) are found throughout the tube. The mucus becomes especially important farther along in the tube, when the intestinal contents are dehydrated into feces. 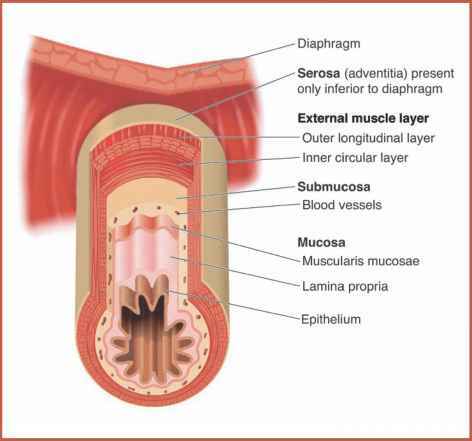 Figure 4.2 The walls of the digestive tube are made up of four layers: the mucosa, the submucosa, the muscularis (external muscle layer), and the serosa. The layers are illustrated here. would be exposed and subject to further damage and infections from ingested material. Strong chemicals that are ingested may also be harmful until they are neutralized in the stomach. This protective layer of cells is found in the early part of the digestive tube, as well as on the body surface, to protect from abrasion of the tissue and damage to the body. The lamina propria is a layer of connective tissue beneath the epithelium that supports the absorptive cells. This layer contains loose connective tissue with blood and lymphatic capillaries to remove dietary material from the columnar cells and transport the material to the body's tissues. The muscularis mucosae has a thin layer of smooth muscle around the lamina propria. This layer helps move food through the digestive tube. The second major layer of the digestive tube wall is the submucosa. This layer, similar to the lamina propria but thicker, has connective tissue and blood vessels. The submucosa also has some nerves to assist in regulating the digestive process, lymph nodules to screen for foreign material that may cause antibodies to be made, and sometimes glands, depending on the part of the tube. These adaptations to the submucosa will be discussed in the following chapters. The third layer of the digestive tube wall is the muscu-laris. This layer is similar to the muscularis mucosa, but is much thicker and has two layers of smooth muscle. The inner layer of muscle is arranged in a circular pattern around the tube. The outer layer of muscle cells runs parallel to the tube. Both layers of muscle propel the digestive contents through the tube via a process called peristalsis (Figure 4.3). 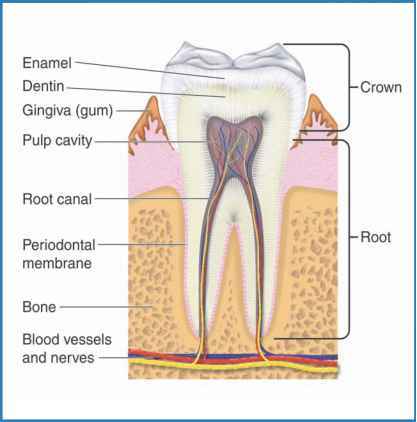 The inner layer nudges the material along with constrictions of the rings of muscle. The outer layer pushes digestive contents through the tube. The parallel arrangement causes waves of constriction that press on the tube, pushing the material. The muscularis has nerves between the two layers of smooth muscle that assist in regulating peristalsis. Figure 4.3 After food enters the mouth, it is pushed down the esophagus through a process called peristalsis. The walls of the esophagus constrict and relax to move the bolus of food toward the stomach. covering of the visceral organs in the peritoneal cavity. This layer is made of dense, fibrous connective tissue throughout the tube. The only difference is the name given to the covering, based on the location of that part of the tube. This serosa/ adventitia of either beef or pigs is used commercially as the outer covering or casing on sausages, kielbasa, and certain types of hot dogs. What is the The wall of the digestive tract made from? What are the four layers of gi tract? What are the layers of the digestive tract? What is meant by lining of digestive biology? What part of body is called peristalsis? What tissue is the mucosa of the digestive tract made up of? What muscle found in digestive tube? What is the general structure of digestive tube?